These corded ear plugs feature a triple flange design hugs the ear canal and increases attenuation. The EAR UltraFit ear plugs are washable and reusable, making them an economical choice and the advance polymer material gives maximum comfort and durability. Hearing protection NRR 25 dB. 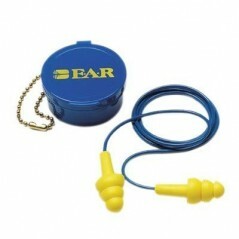 Each pair of corded ear plugs come with their own carrying case. 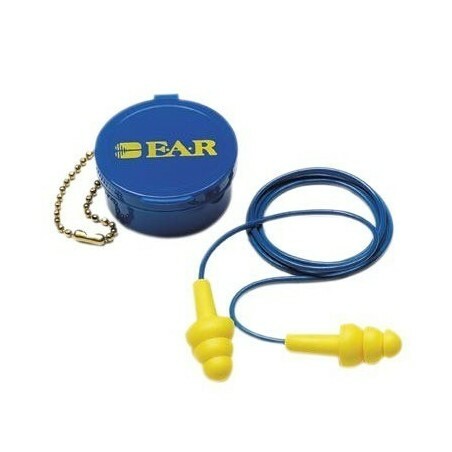 Corded ear plugs are often used in manufacturing situations and other production facilities where employees must move from one section of the facility to another. The presence of the cord makes it possible to quickly remove the plugs from the ears when moving into an area that is relatively quiet, and just as easily return the plugs to the ears when going back into a noisy section of the facility. Another benefit of corded ear plugs is that they are not easily lost like uncorded ear plugs.